You can get a pumpkin spice chai latte at Starbucks (or at other coffee shops that offer PSL type drinks) by asking the baristas to add pumpkin spice syrup to your chai tea latte as a sweetener. Pumpkin spice and chai tea are a great combination of two spicy drinks and I don’t know why it isn’t a promoted seasonal item at Starbucks. 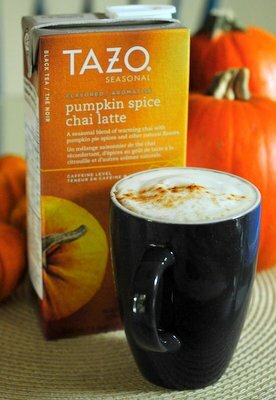 Fortunately, Tazo fans can pick up a carton of Tazo Pumpkin Spice Chai Latte mix at grocery stores and make their own pumpkin spice chai tea lattes at home – and that is exactly what I did. I spotted this seasonal mix at Target recently, alongside the other Tazo teas in the coffee and tea aisle, where it jumped out because of its autumn orange packaging. 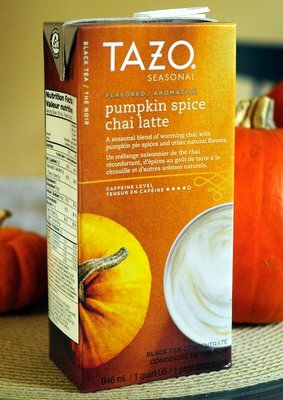 I like the regular Tazo chai latte mix because it has a really potent spiciness to it that is just delicious on a cool morning. The pumpkin version is similar – slightly sweet with a lot of spice – with a distinct nod towards the spices that make up the class “pumpkin pie spice” mix: cinnamon, ginger, cloves and nutmeg. You could really taste the cinnamon and cloves, and the finished latte really smelled like fall in a mug. It is delicious if you love chai and even better than the regular chai latte during the fall – or if you want to serve a hot drink alongside a slice of homemade pumpkin pie. If you like chai tea but don’t like your drinks overly spicy, you might want to add a little more than 50% milk to this mix when using it, since the spices are quite assertive. If you’re serving it for dessert, consider topping it off with some whipped cream and a sprinkle of ground spice to dress it up a bit.